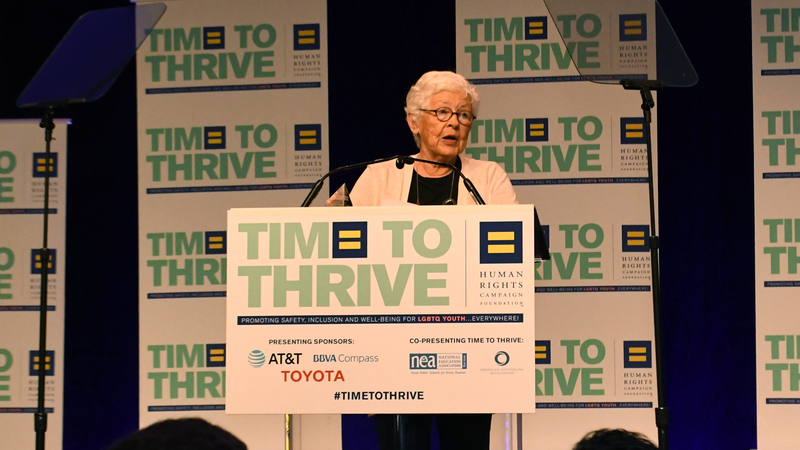 HRC Foundation’s fifth annual Time to THRIVE Conference in support of LGBTQ youth commenced on Friday in Orlando with an opening plenary featuring advocates, award-winners, special guest speakers and musical entertainment. The annual event is held in partnership with the American Counseling Association and the National Education Association, with AT&T, BBVA Compass and Toyota as presenting sponsors. In its fifth year, HRC Foundation’s premier national event addresses safety, inclusion and well-being for LGBTQ and questioning youth, and brings together youth-serving professionals to discuss best practices for working with and caring for LGBTQ youth and their faimilies in schools, community centers, health care settings and beyond. The evening opened with a tribute video and moment of silence to recognize the the deadly attack on Pulse nightclub in Orlando on June 12, 2016, which claimed the lives of 49 innocent people -- most of whom were young, LGBTQ and Latinx. We also paused to remember the lives tragically taken on Wednesday in the massacre at Marjory Stoneman Douglas High School in Parkland, Florida. Rep Carlos Guillermo Smith; Christine Leinonen, mother of Pulse victim Christopher “Drew” Leinonen and advocate for gun safety; and Brandon Wolf, Vice President of the Dru Project, spoke to the need for common-sense gun safety legislation. Longtime LGBTQ advocate Betty DeGeneres and pediatric endocrinologist Dr. Ximena Lopez were presented with Upstander Awards for their dedication dedication to and support of the LGBTQ community. DeGeneres, mother to Ellen DeGeneres, has been a tireless advocate for the LGBTQ community. She was the first non-LGBTQ ally to join HRC’s National Coming Out Project and has published three books on being a part to LGBTQ children. Dr. Lopez founded the GENder Education and Care Interdisciplinary Support (GENECIS) program at Children’s Health in Dallas, the only clinic in the Southwest specializing in health care for transgender youth. She also contributed to HRC’s “Supporting and Caring for Transgender Youth” resource and shared her expertise at HRC’s 2016 Time to THRIVE Conference, and recently gave a TEDMED talk on her inspiring work.